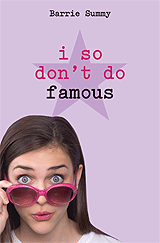 Book review: "I So Don't Do Famous"
This review first appeared in Turbula in January 2010. Glancing over their catalogue, it seems the folks who run Delacorte Press (a Random House imprint) have a rule that four books make a series in its juvenile titles for tweens and teens. After that, come up with a new protagonist and move on to the next four-book series. It will be a real shame if such inflexibility is imposed on Santee author Barrie Summy's "I So Don't Do ..." tweener series, whose fourth and hopefully not final title, "I So Don't Do Famous," shows junior high detective Sherry Baldwin to be just coming into her own as a memorable character. The latest title finds Sherry encountering serious middle school angst. Her boyfriend, Josh, is moving on to high school  and his embarrassment at still dating a middle-school girl while in high school is putting stress on their relationship. While she deals with her first real heartache, Sherry also wins a national writing contest run by a teen magazine and is soon on a plane with her father and best friend, Junie, bound for Hollywood. Sherry's late mom, a police detective who was killed in the line of duty, is now a respected investigator in the ghost world and joins Sherry in Hollywood for the chance to try to learn why Marilyn Monroe's spirit still lingers in Tinseltown rather than crossing over. When the magazine's star columnist has her diamond-studded purse stolen at Sherry's awards banquet, Sherry, too, has a mystery to solve. Summie's writing continues to improve with each outing; the dialogue here remains fresh, the characters continue to charm, and the story arc is logical and flows naturally. It's clear that Summie is still having fun with the series, and her readers can only hope that more Sherry Baldwin adventures await.